On Saturday the annual Foot Locker Northeast Regional Championships took place at Van Cortlandt Park in New York, New York. Top ten individuals in the championship races advance to Foot Locker Nationals in San Diego, California on December 9th. New Jersey qualified four individuals out of Regionals for the prestigious event. 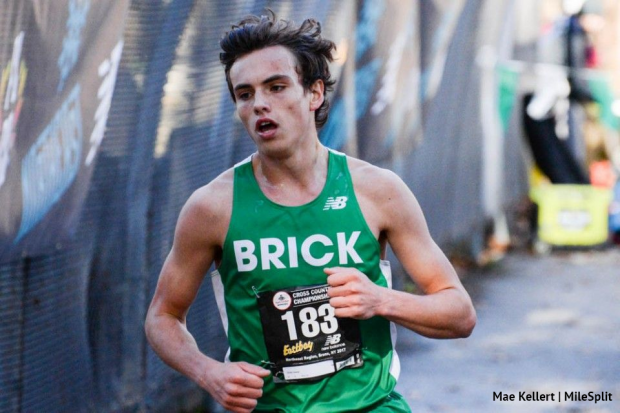 After a tough state championship season Damien Dilcher of Brick Township felt redemption when he crossed the finish line in second with the clock reading 15:37. He was less than five seconds behind race winner and Massachusetts State Champion Tristan Shelgren. This was Dilcher's first experience at the regional level and the senior took the bull by the horns, he was even leading the talented field with less than a mile to go. He isn't the only Ocean County star to move on, Meet of Champions winner Devin Hart of Pt. Pleasant Boro finished sixth among his Northeast peers at 15:42. Only a junior this is Hart's first run in the Foot Locker, his goal was to not only advance but to also gain vital experience for next year's attempt. In ninth running 15:52 to finish up New Jersey's boys qualifiers was Group 1 State Champion Fahd Nasser of McNair Academic. The North Jersey senior has had a breakout season winning his first Group title and placing third at the Meet of Champions. This is New Jersey's eighth time qualifying three boys to Foot Locker Nationals in the past ten years. On the girls side we had one move on, star junior Abby Loveys of Randolph competed in her first Foot Locker Regional and placed ninth running 18:23. She is one of only three that return next year from the top ten qualifiers. Loveys won the Group 4 state championship two weeks ago and finished seventh at the NJSIAA Meet of Champions. Defending Regional Champion Alyssa Aldridge did compete but had to drop out due to some breathing trouble. A season shortened by injury but which still saw a Group 3 title and second place finish at the Meet of Champs. Though they didn't qualify for Nationals... sophomore Jack Jennings of Mendham, 16:10 and senior Justin Kelly 16:11 both cracked the top 20 in 14th and 16th. Soph Corinne Barney of Indian Hills, 19:01 and senior Rachel Kenny of Matawan were 16th and 17th in the girls championship race. Also of note in the Girls Frosh Soph race New Jersey girls finished second, third, and fourth thanks to freshmen Laurel Kurtz, Alexa Palmieri, and Sophia Lore. Ryan Kear fourth in the boys Frosh Soph division.